Flank steak isn't the fanciest or most tender cut of meat on a cow, but it does have some very distinct advantages if prepared correctly. 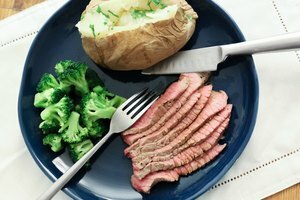 Flank steak can be a very cheap and very versatile option for a true steak lover. Here are some ways to cook the perfect flank steak. Because flank steak is a tougher cut of meat, it can't just be thrown on the grill or in the pan the way a fine T-bone steak would be. One method for making the steak more tender is to soak it in a marinade. It is also a perfect opportunity to add more flavor to the meat. Marinades can be made using a variety of ingredients, but usually should contain some sort of oil(olive oil is the most popular), some sort of acid (wine vinegar, lemon/lime juice are excellent), and some sort of salt (soy sauce is a popular option). While there are many marinade recipes, the best can be created by playing around with flavors to please your palate. 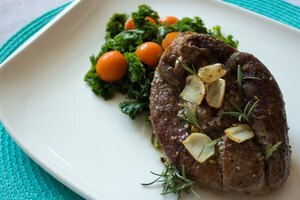 The steak should marinate for anywhere from 2 to 12 hours. Flank steak can become hard and leathery if overcooked, so a short blast of hot, direct heat is the best cooking method. You can do this either on a grill or in a pan set to high heat. Coat the grill grate or pan with olive oil, and place the steak on the cooking surface. Allow it to cook for no more than 4-6 minutes on each side, for a total of 16-24 minutes. Flank steak is too thick to be cooked well-done. The end result should be medium-rare. After it has cooked, cut it into thin slices and serve. 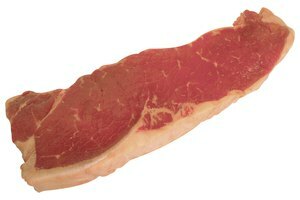 Flank steak is used so commonly in Asian stir fries that it is sometimes labeled as "stir fry meat". The key to turning flank steak into a delicious stir fry is to slice the meat into strips as thin as possible so that they don't become too tough to chew. After cutting the steak into strips, place in a pan or wok with a little olive oil and cook the meat all the way through, stirring them as they cook. This should take only a few minutes if the pieces are thin enough. Then add whichever stir fry vegetables you prefer and some stir-fry sauce, or just plain soy sauce. Serve with rice. 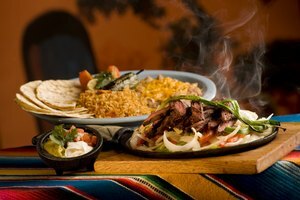 Flank steak is also extremely popular in Mexican cuisine. It is the meat commonly used in creating steak tacos. 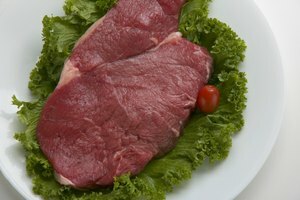 Skirt steak is traditionally used in the making of fajitas, but flank steak comes from a similar part of the cow and can be used as a substitute. Again, the smaller and thinner the flank steak is cut, the better. In addition to salt, Mexican spices such as chili powder and cumin make great additions to flank steak. The steak should be as in a stir-fry, and then served with onions and peppers in a flour tortilla.